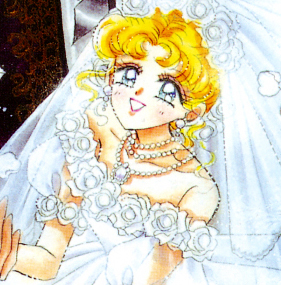 In volume 12, act 60, Usagi finally marries her beloved Mamoru. It is a beautiful ending of a great manga series, where all sailor soldiers are present, and there is also a hint about the future. 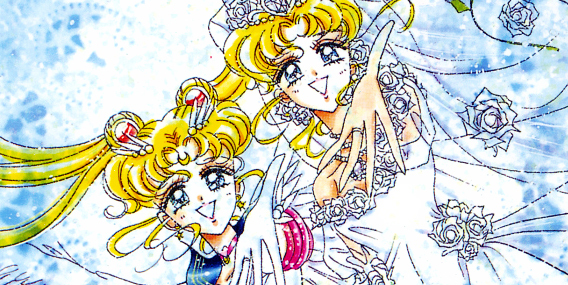 Usagi (left image) has a beautiful wedding ring. It has a pink heart-shaped jewel in the midde, with smaller stones surrounding it. 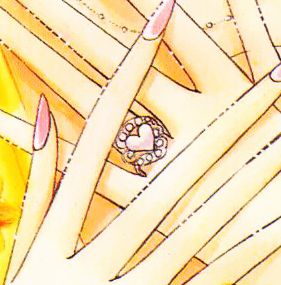 Usagi's ring was frequent both in the manga and the artbooks, unlike Mamoru's. His simple, silver ring was never seen in the manga. It can however, be found in a drawing in the Original Picture Collection Vol. V artbook. 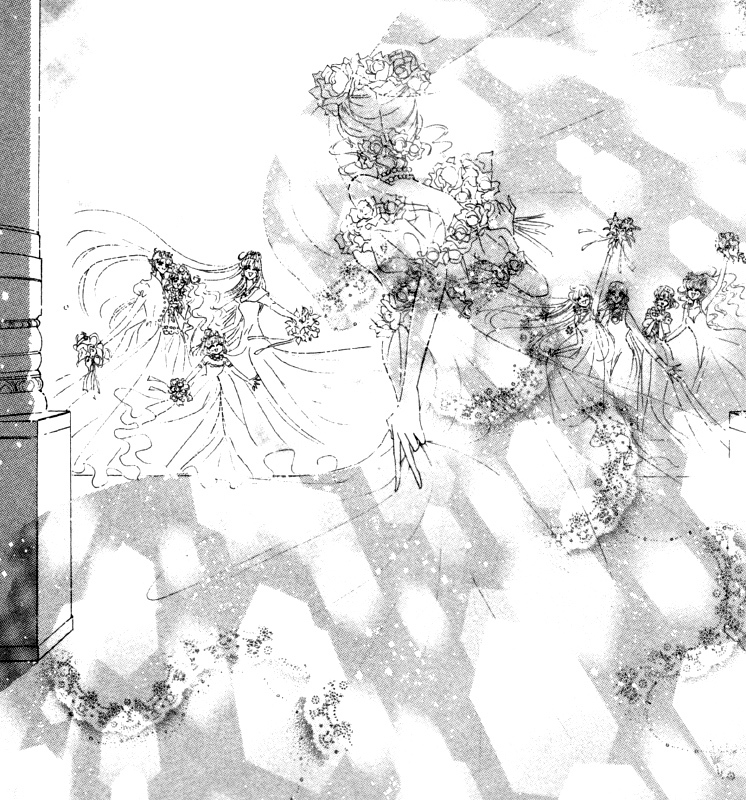 Usagi wears a beautiful white wedding dress, decorated with white roses. She has a long transparent veil. 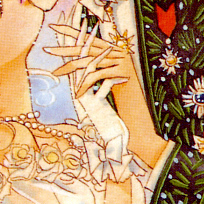 On her hair sits a jewelled hair decoration, surrounded by white roses. 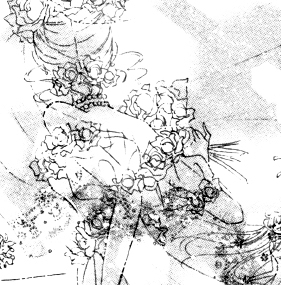 At the end of volume 12, there is a drawing where she also wears fragile white gloves decorated with ribbons. They are also present in the fifth artbook. A constantly recurring item in her outfit is the white roses. White roses represents innocence and purity and are by tradition associated with marriages and new beginnings. They are also a symbol of honor and reverence. 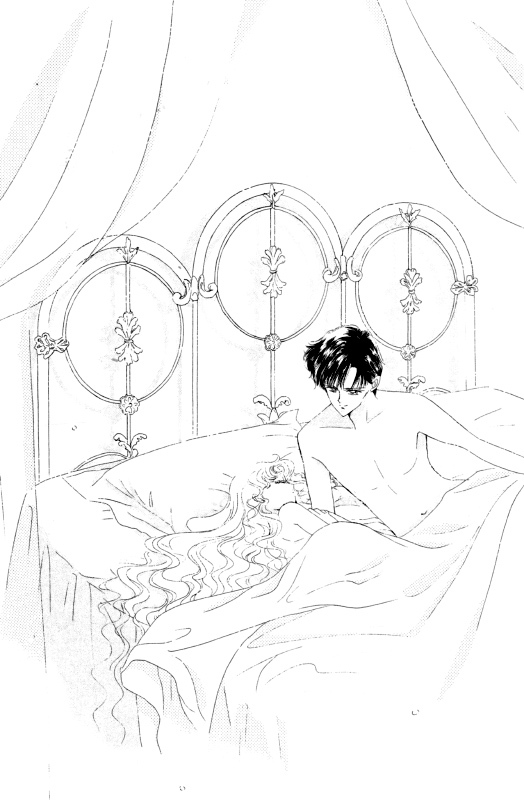 Mamoru wakes up, laying next to Usagi in a big beautiful bed. He leans over and wakes her with a kiss. "Morning, Mamo-chan..." says Usagi. "It feels like I've been having a long, long dream." "What kind of dream?" he asks. 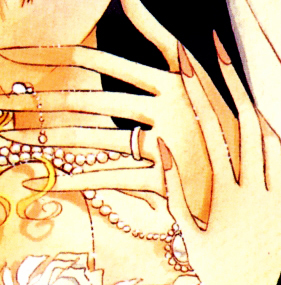 After a brief moment of silence, Usagi looks at her beloved Mamoru, touching his face with her fingertips. "Hey, Mamo-chan... Say those words one more time." "I already said them fifty times last night." Usagi smiles cheerfully. "Just once more!" "Okay. One last time," he says and kisses her. "Marry me, Usa." 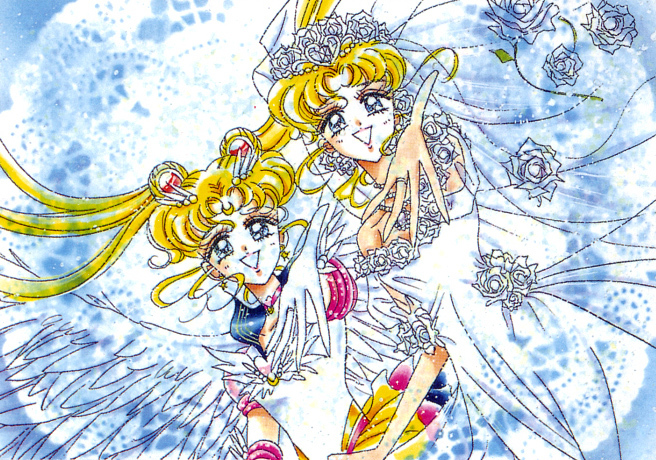 Usagi and Mamoru, now in their dress and tuxedo, are kissing inside of a church. A bright light suddenly appears in Usagi's chest and she smiles happily. Mamoru looks curiously at her. "I felt something now," she says. "That a star was being born inside of me. That soon, our daughter... a new sailor soldier will be born." 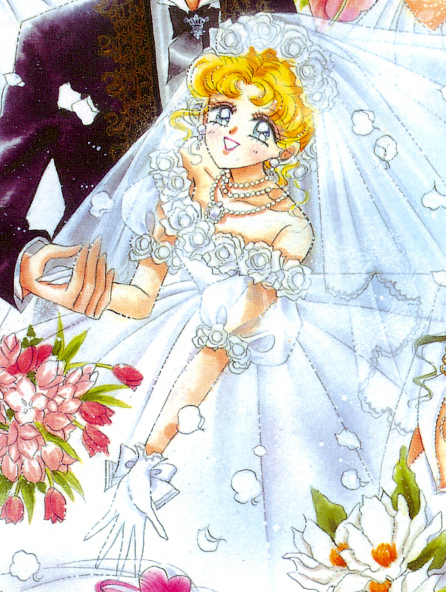 Usagi holds her wedding bouquet in her hands."Say... Until our duties end someday, will we always protect this planet together..."
"We will," says Mamoru. "Of course we will." "Will we always live together?" "I promise. We will always be together," he says and she reaches out to kiss him. "I promise too," she thinks. "I will always protect you." She runs outside, where everyone are waiting for them, happily smiling and holding flowers. "And I will always protect our precious friends." 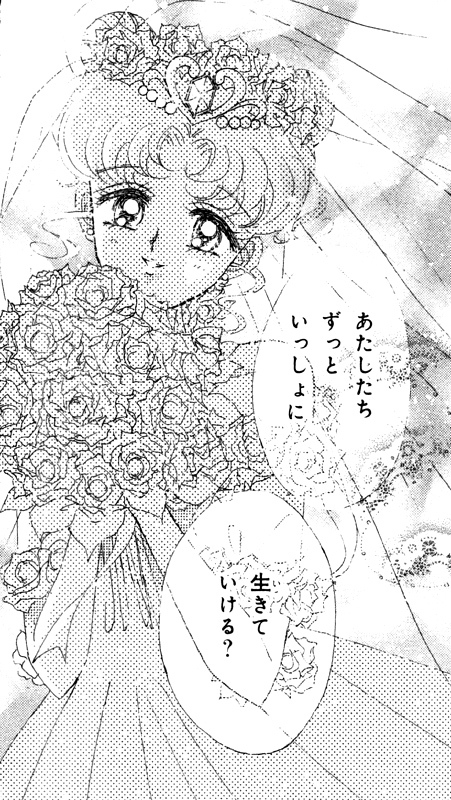 She joins the girls and turns around to call out for Mamoru who looks at her. "Even if someday we are gone," he thinks, "and new sailor soldiers, new stars are born... Sailor Moon, you will forever be immortal. For all eternity, you will be the most beautiful, brilliant light."